Hilary makes one-off ceramic pieces inspired by natural objects and ancient classical vessels with tactile, both with textural surfaces and vibrant colours. The influence of the elements ‘wind, water, earth and fire’ are both implied and literally employed in the execution of the pots themselves. The majority of the pieces are coil built, while others are made with slip and press moulds. Having worked for many years in terracotta with matt alkaline glazes, white stoneware or porcelain are now her preferred clays. 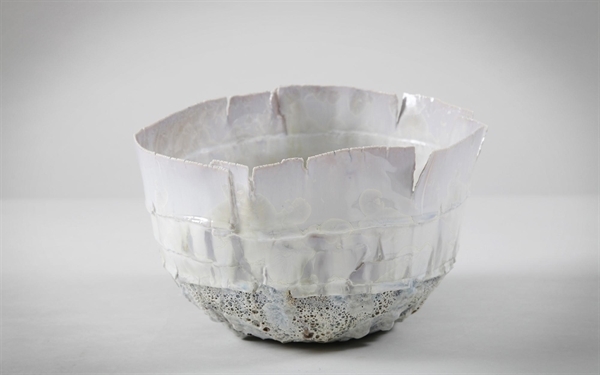 The higher firing temperatures required create much more integration of clay and glaze, allowing the opportunity to experiment with the chemical interactions of many more raw materials and oxides. Glazes are applied in multiple layers until the desired – or sometimes unexpected – effect is achieved. The work on show follows two themes: the azure blues and turquoises and, most recently, the exploration into the volatile magic of crystalline glazes, in combination with eroded and volcanic surfaces.